The most recent data available related to allergies for young children is from 2007 and was collected through the National Longitudinal Survey of Children and Youth (NLSCY). As the NLSCY is inactive, there is a significant data gap in the area of allergies for children under age 6. Source: CICH graphic using data adapted from the Statistics Canada National Longitudinal Survey of Children and Youth, Cycle 5 (2002-2003) and Cycle 7 (2006-2007) reported in The Well-Being of Canada’s Young Children. A Government of Canada Report. 2011. http://www.dpe-agje-ecd-elcc.ca/eng/ecd/well-being/sp_1027_04_12_eng.pdf -accessed June 22, 2017. 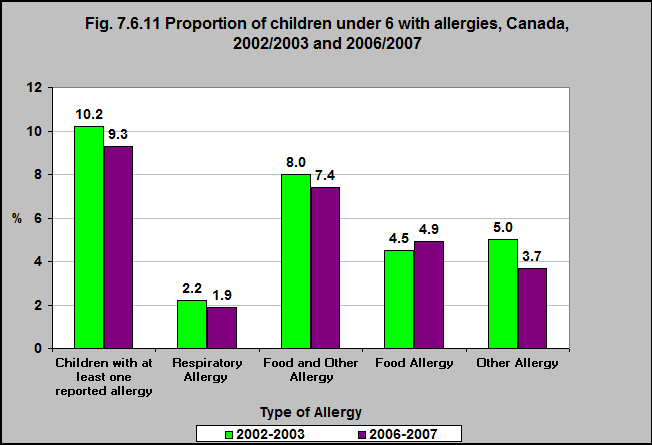 In 2006/07, 9% of children under 6 had at least one reported allergy. That was down from 10% in 2002/03. The most common allergies were food allergies – almost 5% of children had food allergies in 2006/07.